These three young ladies were not sisters and didn't always call themselves sisters. 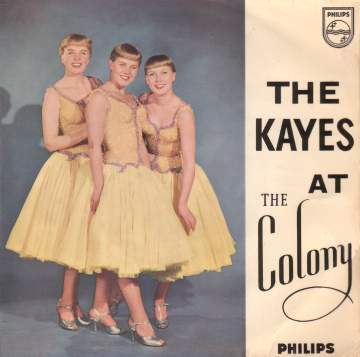 The group were often billed as the "Three Kayes", or simply as the Kayes. However, they always went to enormous trouble to present themselves as identical to each other. With blonde fringe-cut hairdos and similar dresses they came across well. However they weren't related at all and even came from different parts of England. They took their name from their manager, a girl called Carmen Kaye whose inspiration and determination got them started. They were probably Britain's only serious rivals to the Beverley Sisters as a closely harmonising girl group. They had great popularity during the mid to late 1950s and were frequently seen on TV and in the charts. One of their best known numbers was recorded with Frankie Vaughan, and is one of few recordings I'm aware of where the featured singer's name is mentioned in the song title. The extremely rare EP featured on the right (BBE12256) was issued during 1959 and shows that even at that time the girls were very much at home as a cabaret act. It is actually a recording of their act performed at the Colony Club, a London night spot. The picture on the sleeve gives a good impression of how they appeared on stage and TV. It is also interesting to note the songs covered on this EP that weren't issued as singles were all hits by other artists. However the Kaye Sisters' star waned somewhat as the 1960s progressed although they could still be found in cabaret up until the late 1970s. However, like their rivals the Beverley Sisters, they managed to establish themselves much later as a nostalgia act, and once more found themselves in cabaret. Philips BBE12166 1958 "Presenting The Kaye Sisters"
Philips BBE12256 1959 "The Kayes At The Colony" w. Felix King and Orch. Philips BBE12392 1960 "Kaye Sisters Favourites"